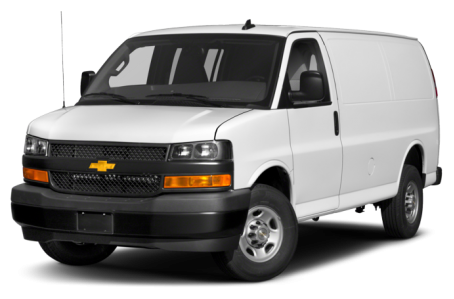 The 2019 Chevrolet Express 2500 comes as either a Cargo Van or a Passenger Van. The Express Cargo Van has regular (135 inches) and extended (155 inches) wheelbase options. The Express 2500 Passenger Van only comes with a regular wheelbase, but it has two available trims: the LS and LT.
All engines for the Express 2500 are mated to a six-speed automatic transmission and rear-wheel drive. A 276-hp, 4.4-liter V-8 engine comes standard, while a 341-hp, 6.0-liter V-8 is optional. The Cargo Van also has an available 181-hp, diesel 6.6-liter V-8 version.